Our parents take care of our needs and aspirations and try their best to keep us happy and successful in life. But as they grow older, we often neglect them and consider them as a burden. This not only makes them feel sad, but also makes them feel unwanted. As a result, they no longer are able to live with their children. Asha Deep Foundation respects these ‘senior citizens’ and welcomes them in the Day Care Centre to fulfil their basic needs, improves their quality of life and treat them with dignity and respect. The prime motive behind this project is to make them share their lifelong experiences with each other and provide a certain relief from their loneliness. From past two decades, the Day Care Centre has been working to shoulder the community by taking care of our elderlies. To provide a Day Care Centre for the elderly members of our community who are either neglected, have no children or abandoned by their families and improve their quality of life by giving them emotional and mental support. To provide a clean, healthy day care centre with all essential commodities such as Electricity, drinking water, washroom etc. To monitor their health status every day. To engage them in recreational activities like newspaper reading, singing, dancing etc. Provision of basic hygiene factors like safe drinking water, food and sanitation. Elderlies engage in productive activities and forget their miseries. 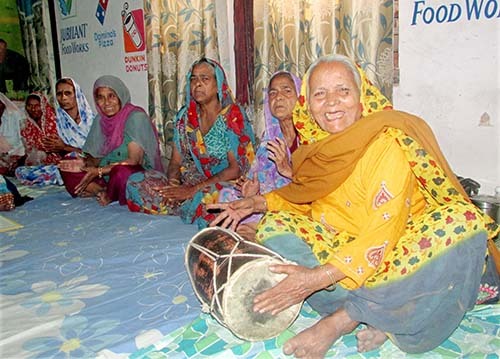 A sense of protection and belonging to the community is felt by the senior citizens. Senior citizens lead their lives in a healthier manner along with the peace of mind. Quality of their lives is significantly enhanced.